How to build a shed roof, Shed roof construction, Shed roof design. The information given below is for building a saltbox style shed, which is the most difficult to build. Go to the following links for building a gable style shed or a barn style shed roof. 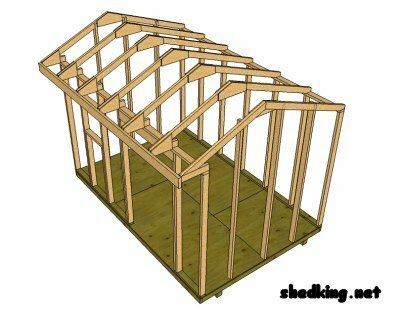 Making trusses to frame in your roof for a saltbox shed is really quite simple! The first thing you will need to do is find a flat open area with a concrete floor so that you can lay out a 2x4 or 2x6 that is at least as long as your shed is wide. Now, whatever the width of your shed is measure and mark this off on the 2x4. This will be the exact width of your shed. Draw an outline of your truss using the measurements off your plans on top of your 2x4. 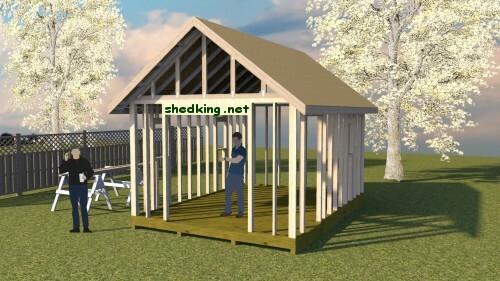 Each truss for your saltbox shed consists of 3 pieces as illustrated above. What you will need to do next is take measurements off your drawn out pieces and transfer them to 2x4s and go ahead and cut them so they can be used as a template for the rest of your truss construction. Or you can simply lay 2x4s on top of your drawing, mark off your cuts for each piece, cut, and lay back down on your drawing to make sure your pieces line up exactly. 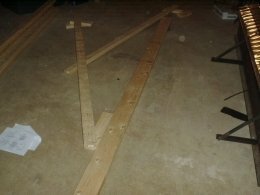 Here's a simple way to cut truss angles using a speed square. Next you will need to assemble your trusses. This is best accomplished using gussett plates made from 1/2" plywood or OSB material. For this saltbox truss you will need to cut 4 for each truss as shown in the picture below. Before building all your trusses needed, make sure after building your first truss that it actually will fit properly on the top plates. After verifying that everything lines up correctly, you can make the rest of your trusses. At this point, you need to mark off truss locations on the top plate of each supporting wall. With the saltbox style shed and the gable style shed you'll be nailing truss ends on one wall all the way down, then move over to the next wall and nail those ends last, making sure everything is lined up properly. Here's the procedure you can use to nail and attach trusses to the top plate. Nail each end down with 3-16d nails. With the barn style shed, I will nail one truss end down then move to the other end and nail it down before nailing on my next truss. Use this technique to get your trusses to line up just right. After positioning and attaching your last truss, now you are ready to start sheeting your trusses. Two very important points to remember are to make sure your trusses are perfectly on center before nailing your sheeting to them, and make sure that the first sheet you nail on each side is perfectly flush with both the bottoms of each truss and the outside truss. This will help to insure that your roof is square. Starting at the bottom edge first, lay one of your 4' x 8' sheets of osb so that the bottom edge is flush with the truss ends. Nail into place with 8d box nails at each truss location at the bottom of the sheet. Now make sure the outside truss is flush with the edge of your osb sheet and nail into place every 6 inches. Line up your other trusses making sure they are spaced properly and nail into place the same way you did with your outside truss. Continue sheeting your trusses in the same fashion. Try to stagger your sheets for strength purposes. In otherwords you don't want your end joints of each row lining up with each other. Many of you know how to already build shed floors, walls, and doors. All you need is a plan for roof trusses. If you have any fascia boards to nail on now is the time to do this. If you plan on putting on drip edge and felt paper to your roof do this now also, then cover your roof with shingles following manufacturers instructions. I do recommend using felt paper and drip edge on your shed, even though it is just a shed. The cost is minimal and worth it in the long run. 15# felt paper is fine as opposed to 30#. If the pitch of your roof is lower than 3-12, then use 30# felt paper. If your roof pitch is lower than 2-12, then don't use shingles. Water will work its way under and rot your sheeting. If this low pitch is the case with your shed roof, then you should cover it with metal or cover it with a rubber membrane that is glued down to your osb. When I shingle the roof, I start with my shingles 1/2" past the drip edge or 1" past if there is no drip edge. This will make it harder for water to work its way under your shingles. Questions About Building a Shed Roof? Have a question about how to build or construct your shed roof? Return from how to build a shed roof to how to build a shed.